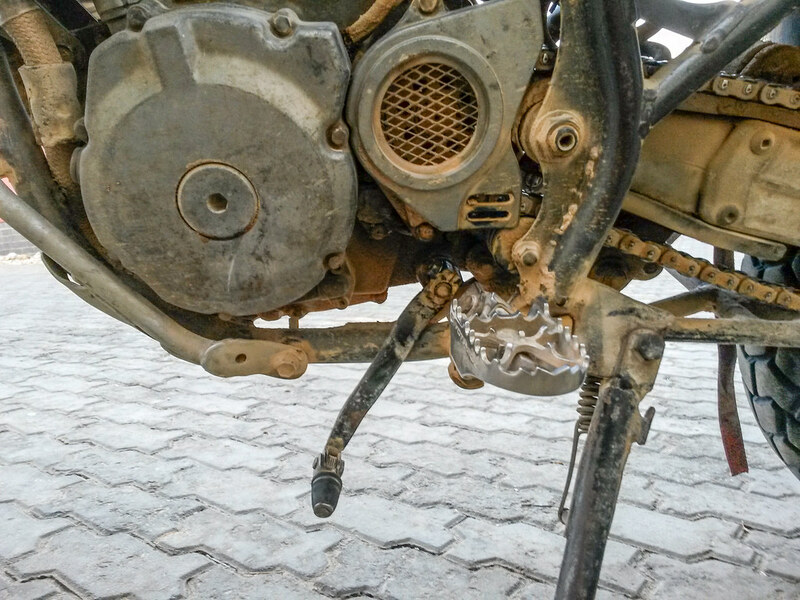 My eye followed the line forward through the sandy dust until I came across Mikes bike, just a few meters ahead of me. The once deep but tidy straight tracks became wobblier and wobblier as the depth of the dust increases. Sucking in a deep breath, I felt pounding in my chest. I know in advance what I am about to hit. I hoped I would make it through and out the other side still astride my bike. Dust billowed up and around me, blinding me and locking me into my own brownish world. I could not see if anyone was approaching from the front, let alone what was happening behind me. When I entered this cloud, I could see a 4×4 not far behind me. Just knowing that in this sunless world made me apprehensive. I hoped this guy was giving me enough space in case I fell off. I didn’t even want to think of the outcome if it all goes wrong. I pulled back on my throttle, increasing my speed just as I hit the worst of Mike’s wobbly tracks. I felt my bike’s rear end start to slide back and forwards. I held my front wheel steady but loose under my hands letting it float. At first it was just a small sideways movement, but left unmanaged it grew until its too hard to regain control. By now my bike was bucking to and fro, like one of those coin operated bulls you see in the movies. I took another deep breath, feeling the instant benefits, I relaxed and opened up my throttle more, in an effort to reign in my bike. Finally, I felt a change in surface under my tires as it becomes slightly harder and I get my composure back. I let out a big sigh “That was close” I say to myself. “Um, yes I want to do that too but…” my sentence was swallowed in another dust storm kicked up by two cars. Geeze, if there happens to be another car following they won’t be able to see us is this swirling brown dust. We let two more dump trucks and several cars pass us almost blindly, letting the nerves get the better of me. “Lets just ride out to where there is a safer place to stop” Mike agrees with me, and we ride on and out of the large dusty strip and up onto the crest of the next rolling hill, where the road is more firmer and lacks dust. From there the road got much better. We let a couple more car slip past us when we could. Generally, you can go a whole day in Namibia only seeing four or five cars, but today as we travel towards Swakopmund we find ourselves in a large convoy. 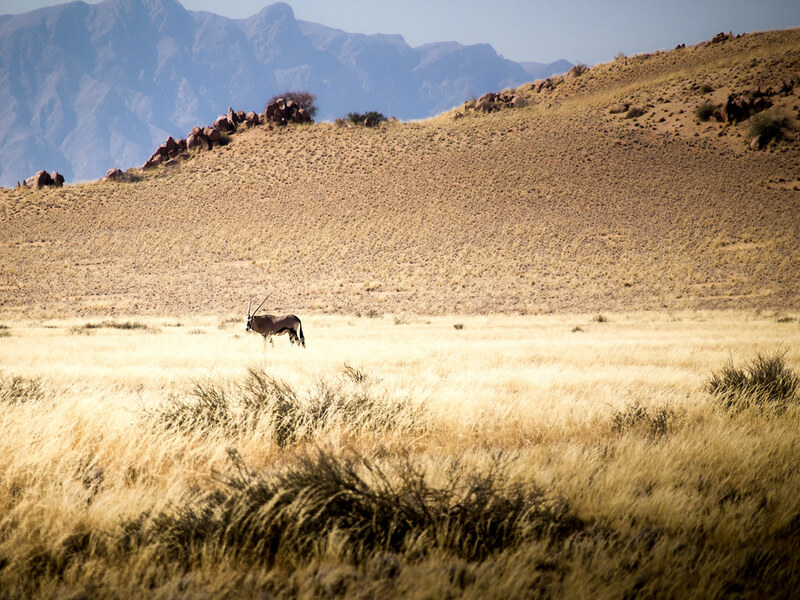 I guess everyone left Sossusvlei at the same time! Anyone in a 4×4 tends to feel as if they own the roads around here and will continue to sit less than a meter away from you and pass you with less. It irks me to the point of boiling anger and if I catch it in time, I will turn to look them in the eyes or indicate for them to move over with my arms. I just want to yell out to them “Remember I am hunan under all this gear!” I know its worthless because if they did run me over, they wouldn’t stop. It’s up to me as a rider to ensure my own safety on the road. I ride like I am a ghost, invisible to everyone. Just as the road works petered out, the great sign of “The Tropic of Capricorn” came into view. I know that once I step onto the other side of this invisible line around the globe, the temperatures should rise to more merry tropic living conditions. I just hope this is true. We stop directly under the sign and recorded this event that only means so much to travellers and yet nothing to those who pass it by on their way to work everyday. Humans are a funny bunch – placing a high value on a “just-a-sign”. Ive past this point in the globe three times now. The first time in Australia, again in Mozambique and now in Namibia. I couldn’t help wondering how many more times I will pass it on this trip. 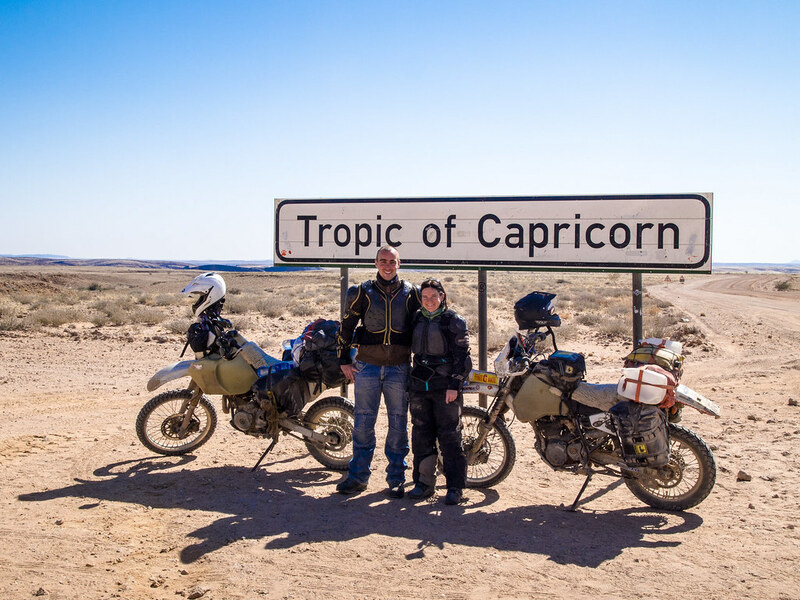 As we rode on towards Swakopmund, our excitement of the day was over once we hit a 100 kilometer long straight road with nothing to see either side of it. This must be what it is like after a nuclear explosion. It was a waste land, without the rubble. The road was unusual, despite it being made from dirt, it acted like asphalt and we could ride at our usual asphalt speeds. Every now and then a mountain would appear in the distance and disappear, then a random sandy road would run off perpendicular to the main road into the horizon. The only excitement we did have on this long flat road was one single tree planted over four years ago by someone who wrote a nice poem “If you have a drop to spare. please share”. We didn’t share, sorry plant. But there wasn’t really a place to park the motorcycles without them falling over and we were completely over this long straight road. We just wanted it done and dusted. This road went on and on and the temperature dropped. I put back on the clothes I only took off two days earlier. Then as we got closer to the sea, the wind picked up and the dunes rose out of nowhere. The sun set over the Atlantic Ocean and golden sand blew across the road. Ahead of me was Mike shrouded in golden light with golden sprinkles flowing under him with more slivering behind him. It looked absolutely beautiful. I wanted to stop and capture this moment, but I was now too exhausted. There was only 30 kilometers left, and I felt it was best to just keep going. It’s funny how sometimes a mere thirty kilometer can feel like a hundred. This was one of those times. I can see the pattern emerging. When I’m cold, tired and hungry I just want the day to be over and done with. That’s when the kilometers draw out further and further apart and I feel every centimeter. We finally arrived into the town of Swakopmund. I pulled up to the first four way stop (where everyone is forced to stop and first in first goes – it’s a strange and complicated intersection that I’ve only seen in South Africa and here in Namibia). As I took off from the intersection I felt my gear shifter rotate with my boot but I couldn’t change gear. That’s odd, I look behind me and changed lanes slipping the clutch to keep control and not stall the bike. Mike saw what I was doing in his mirrors and pulled off the road too. I glided to a stop behind him and turned off my bike. My gear shifter hung downwards and swinged gently in the wind. Kneeling down next to my bike with my tools in hand I attempted to tighten the bolt. It worked for a split second, but then it dropped again. Mike called a guest house to make sure there is enough room for us and I decided to ride my bike as is: not knowing which gear it was in and just hoping it’s not in fifth. I pulled into the five o’clock traffic stream, grimacing as I drag my clutch through take off. What I didn’t expect is that this town is built on a one way system and at every corner is a four way stop or a red traffic light. At one particular intersection, I managed to change down a gear. I wasn’t not in first, but maybe in second or third!? We crossed the entire town to get to our guesthouse. Pulling up to the gates of our guest house, waiting for the lady to open the gates. She took her time as I felt my blood start to boil. I was tired, hungry, cold and now frustrated with my bike. I turned my bike off, while I waited. I didn’t want to put my clutch through the pain of another drag. So I pushed my bike through the guesthouse gates and up the hill to front steps. The lady who let us in, showed me the room while Mike checks in. Her kindness made me realise my tiredness and problems are not hers, I shouldn’t be angry at her. Tomorrow is another day, everything will look clearer then and I will be able to make a plan with my bike.